I like celery. After all, it makes a great foundation for processed cheese spreads, peanut butter, and cream cheese. I like the crunch it makes and I especially love it cooked in stews and soups. My favorite part is those small, yellowish green tender rib pieces in the middle of the celery bunch. And don’t even get me started on celery salt. Photo: celery. Credit: Popolon; Wikimedia Commons. 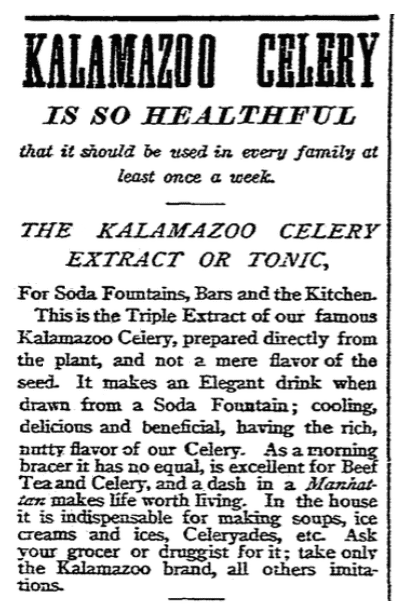 Newspaper ads promoted the health benefits of celery. Tableware is reinvented as time goes by. Food fads come and go – and with them, must-have dishes for serving foods at meal times. Celery vases (also called celery glasses or celeries) were used for 100 years, starting about 1800, as a way to display and serve celery on one’s dining room table. 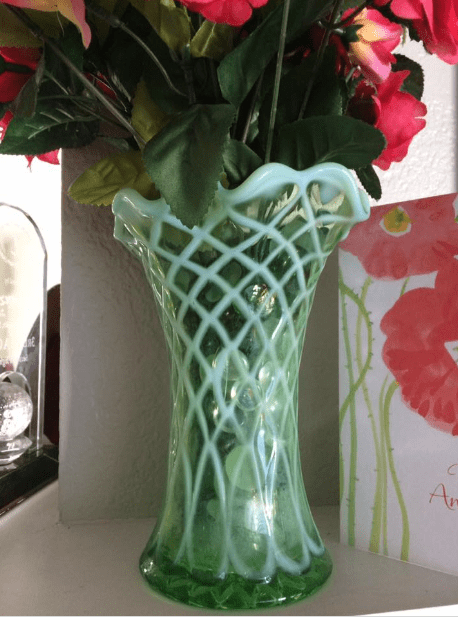 Photo: celery vase. Credit: Laurice Hubka Johnson. You can read more about this collection on the University’s blog, UNCG Special Collections & University Archives. 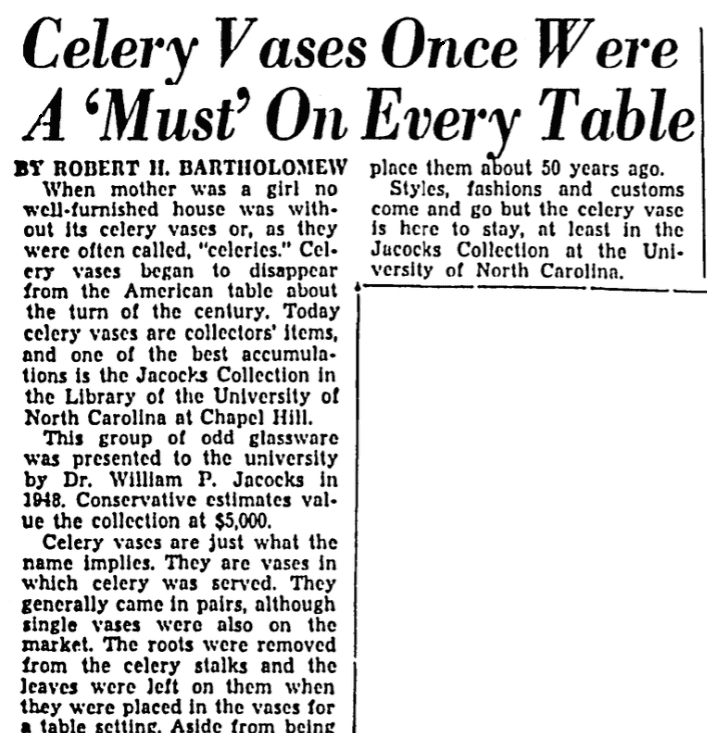 Celery vases gave way to celery dishes – made complete with individual salt cellars – which then led to more simplistic celery trays made of pressed cut glass. 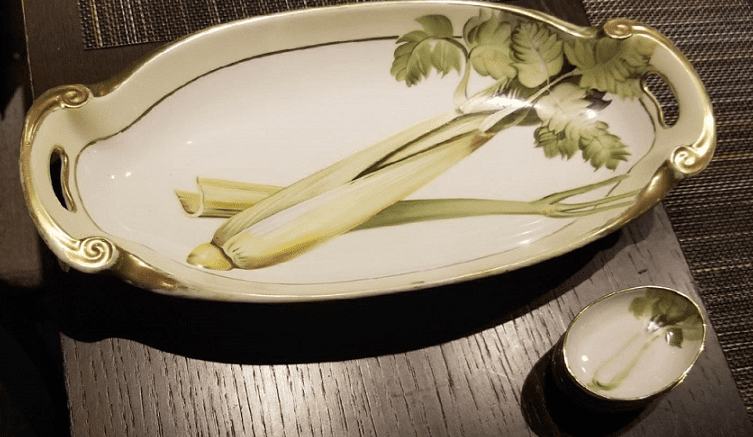 Photo: celery and salt dishes. Credit: Wendy Grant Walter. 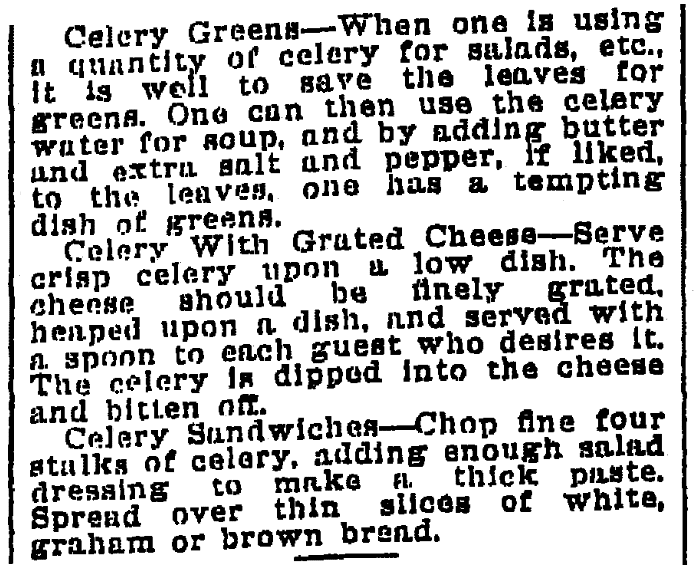 It would seem from this 1893 newspaper article that the times were changing, and a simpler solution for serving celery was on the horizon – but not really completely realized for several decades. This simpler solution? 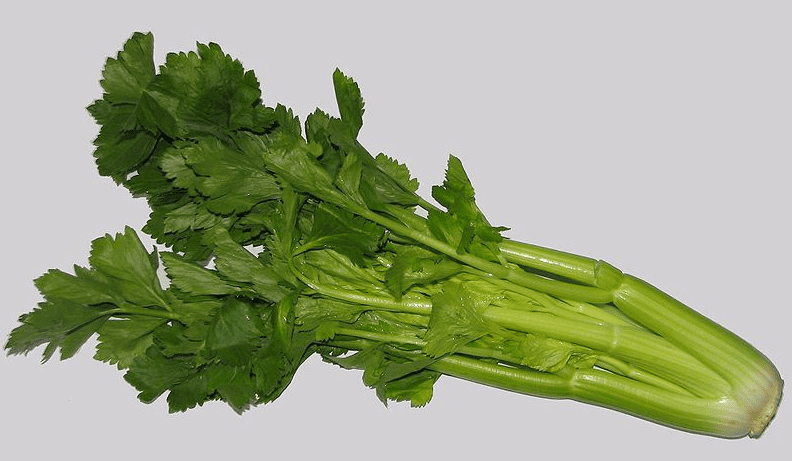 Place a few stalks of celery on each person’s dinner plate and get rid of dedicated celery dishes or vases. You can probably think of a few ways to serve celery based on your own familial recipes. But previous generations were much more creative with how they used celery. 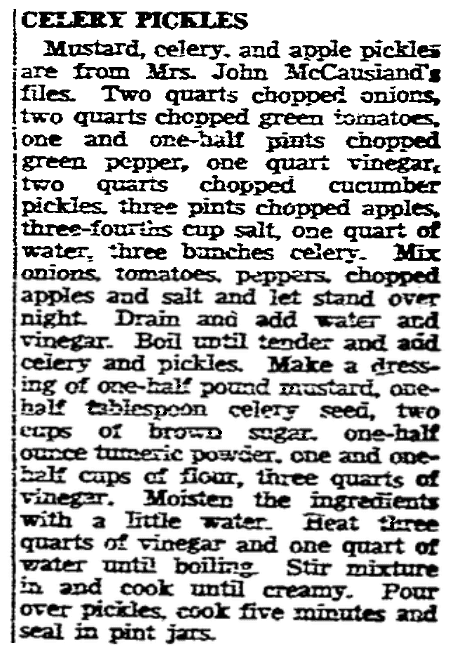 Take for instance this 1942 recipe for Escalloped Celery. This side dish is most likely foreign to most of us today, but you could try it at home and see what you think. 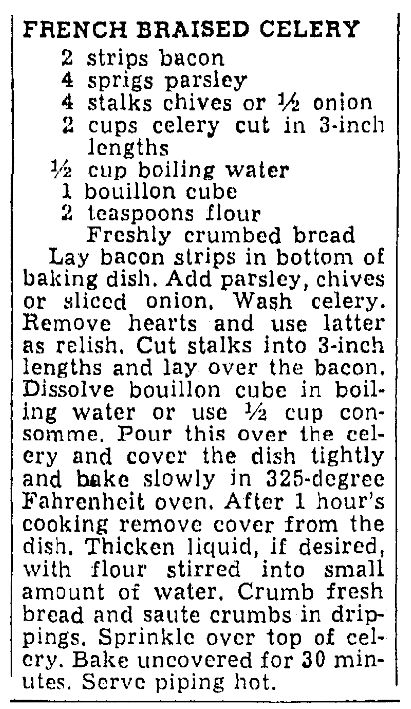 A 1946 recipe for French Braised Celery includes the introduction “Many a cook has searched for some special recipe for cooking celery.” This recipe is similar to the above but it includes bacon (and who doesn’t like that?). 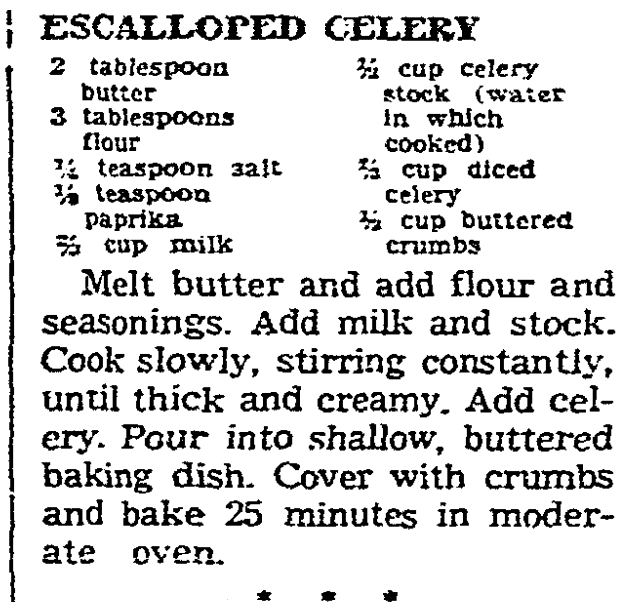 I’m going to admit to you that I have enjoyed reading these older “creative” uses for celery. Our ancestors were clever! 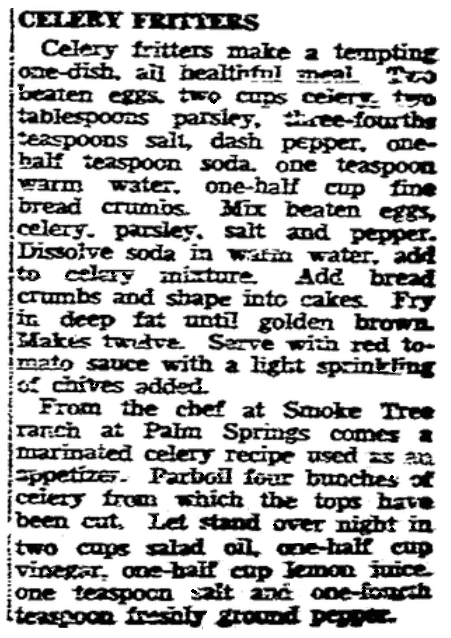 This 1905 newspaper article proves that with its recipes for celery mold, celery relish, fried celery, and celery sandwiches. In case you are hankering for a celery sandwich, all it requires is for you to finely chop celery with mayonnaise or “salad dressing” as this recipe calls for. You could also make Celery with Grated Cheese. 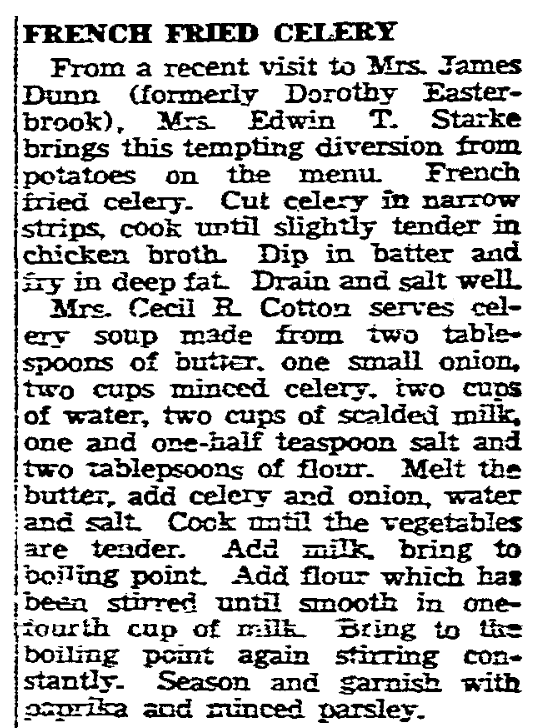 The recipe states: “Serve crisp celery upon a low dish. 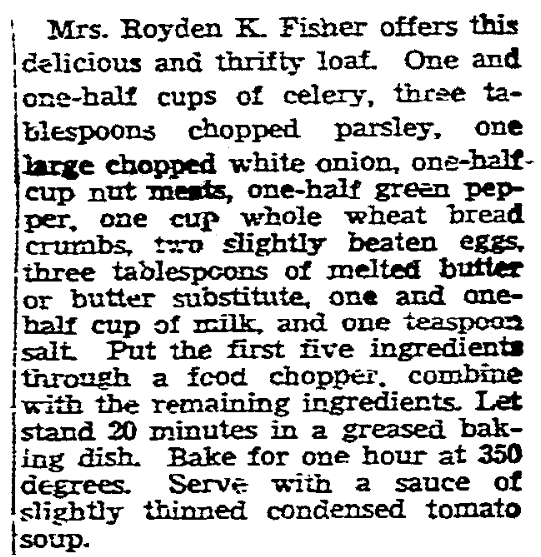 The cheese should be finely grated, heaped upon a dish, and served with a spoon to each guest who desires it. The celery is dipped into the cheese and bitten off.” Sounds simple enough! It makes sense that an area that grows celery might want to promote it, as this newspaper article from Chula Vista, California, does. 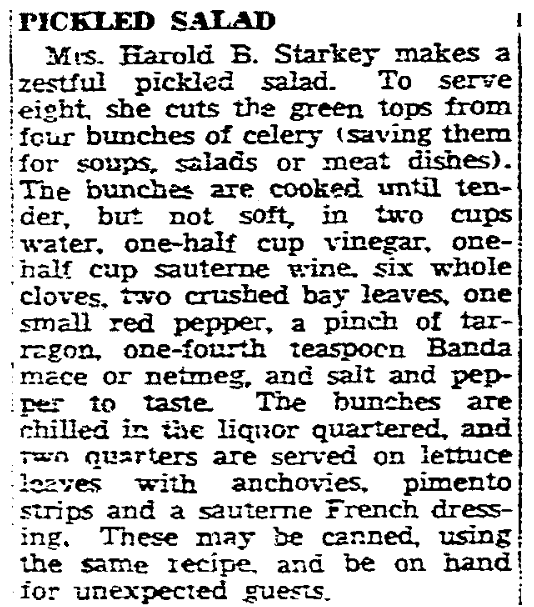 Local women, Mrs. Harold B. Starkey, Mrs. Royden K. Fisher, Mrs. James Dunn, Mrs. Edwin T. Starke, Mrs. Cecil R. Cotton, and Mrs. John McCausland share their recipes for everything celery – including a pickled salad, a celery loaf, and celery pickles. Who Knew Celery Was So Important?! One of the responses I received when I asked my friends if anyone had a celery vase was a quizzical “What’s that? 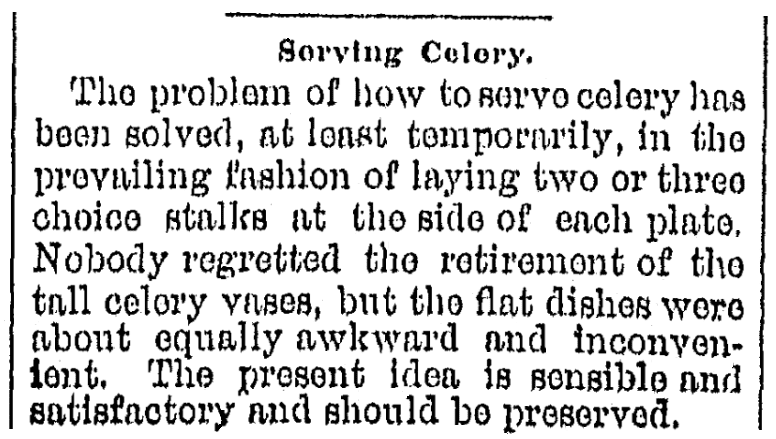 There’s such a thing as a celery vase?” Yes, celery did warrant its own serving dishes and there was a time when celery was an impressive part of a host’s meal because of its expense. Food fads come and go and celery is no longer king of our dining tables, but it’s interesting to discover how important it was to our ancestors. * “Celery Vases: Forgotten Stars of the Victorian Table,” UNCG Special Collections & University Archives (http://uncgspecial.blogspot.com/2017/06/celery-vases-forgotten-stars-of.html: accessed: 24 January 2018).